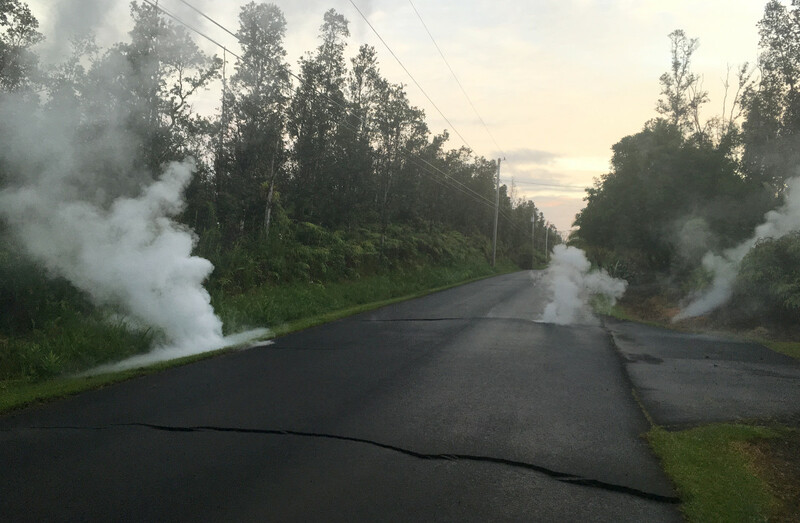 (USGS) Steaming cracks at 5:57 a.m. HST in Leilani Estates subdivision, moments before a fissure opened up on Kaupili Street. LEILANI ESTATES, Hawaii - Hawaii Fire Department reports extremely dangerous conditions due to high levels of Sulfur Dioxide gas in the evacuation area. (BIVN) – High levels of Sulfur Dioxide gas are being detected in the area of the ongoing Leilani Estates lava eruption. “All residents in Leilani Estates and Lanipuna Gardens Subdivisions have been ordered to evacuate. The Pahoa Community Center and the Kea’au Community Center are open for shelter,” civil defense repeated. As of this morning, three separate fissures have opened in the eastern portion of Leilani Estates. Each outbreak has been preceded by ground cracking and strong gas emission. Activity consists primarily of vigorous spattering of lava and development of very short lava flows that have yet to travel more than a few tens of yards from the vent. Earthquake activity in the area remains elevated and ground deformation is continuing. High levels of volcanic gas are reported around the fissure vents. Active volcanic vents are erupting on Makamae, Kaupili and Mohala Streets. Police, Fire and County agencies along with the National Guard are assisting with evacuation.